Mooli paratha – Indian bread or chapathi stuffed with radish filling…. 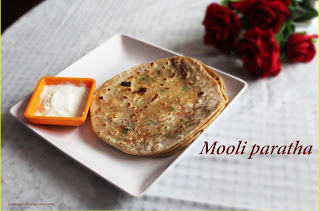 Mooli paratha is a tasty shallow fried Indian bread from Punjab. This is an typical example of stuffed paratha, I said paratha, not our Kerala parotta, but it is the stuffed chapathi where we stuff spicy filling between the chapatti dough. But it is not as easy as aaloo paratha, or methi paratha, but little tricky and needs somewhat experience especially if you are a beginner. 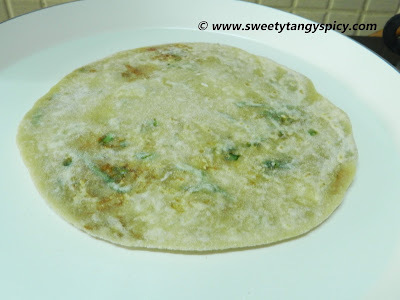 This paratha uses an easy stuffing with radish, radish leaves and some other common spices. 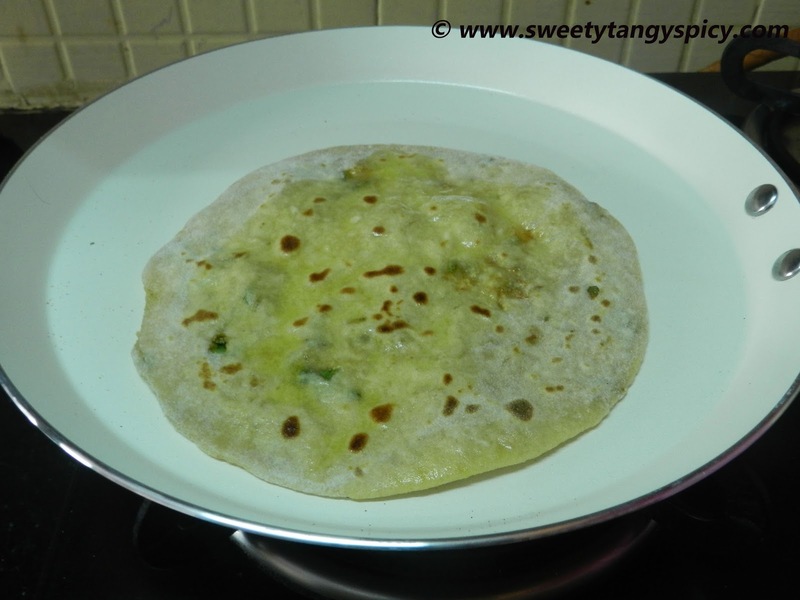 If the radish leaves are not available, then no problem, just ignore it, we can make delicious parathas without radish leaves also. Radish is one of the vegetable which is not much popular in Kerala. A few years back, I was totally unaware about this vegetable. Whenever my hubby purchased it , I used it as sambar pieces only. But you know, we can make so many things with it…. While making radish paratha, the juice squeezed from the radish is used for making the dough. But there will be little more moisture remain in the radish. The first and most important problem while preparing is the breaking of parathas due to excess moisture in the shredded radish. So squeeze it once again before adding the spices. For this recipe, I took three medium size radishes, which weigh about 250 grams in total. 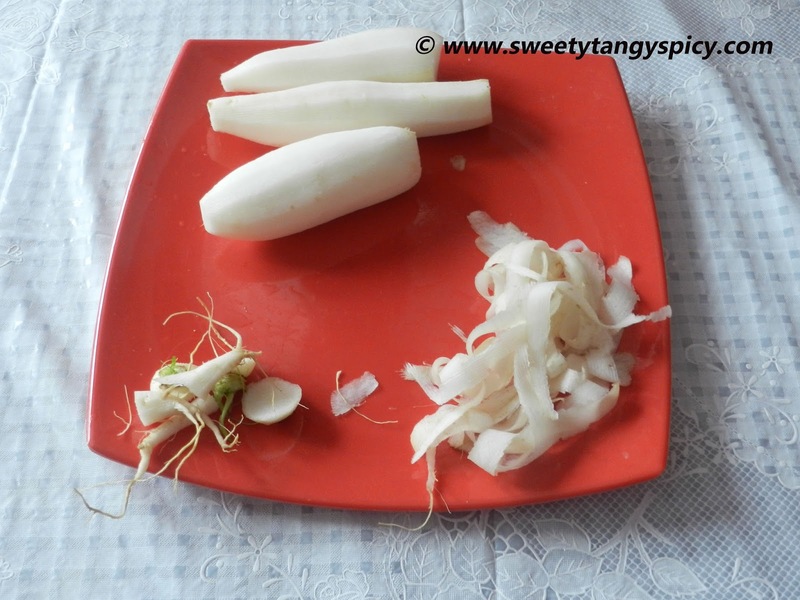 Wash, peel and remove the upper and lower tips of radish with a knife. Then grate with a vegetable grater. 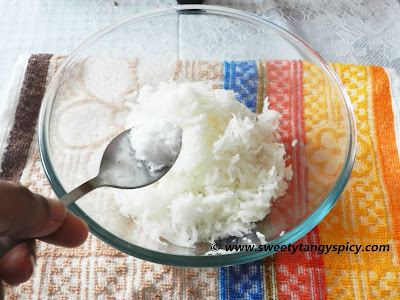 Transfer this into a large bowl. Add ½ teaspoon of salt and mix well. Keep aside for 10 minutes untouched. 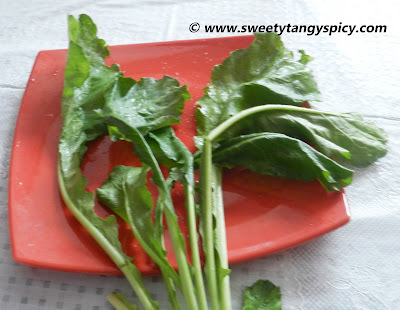 During resting time, take the radish leaves, 3 to 4 leaves will be enough. Discard the hard stem with a knife. 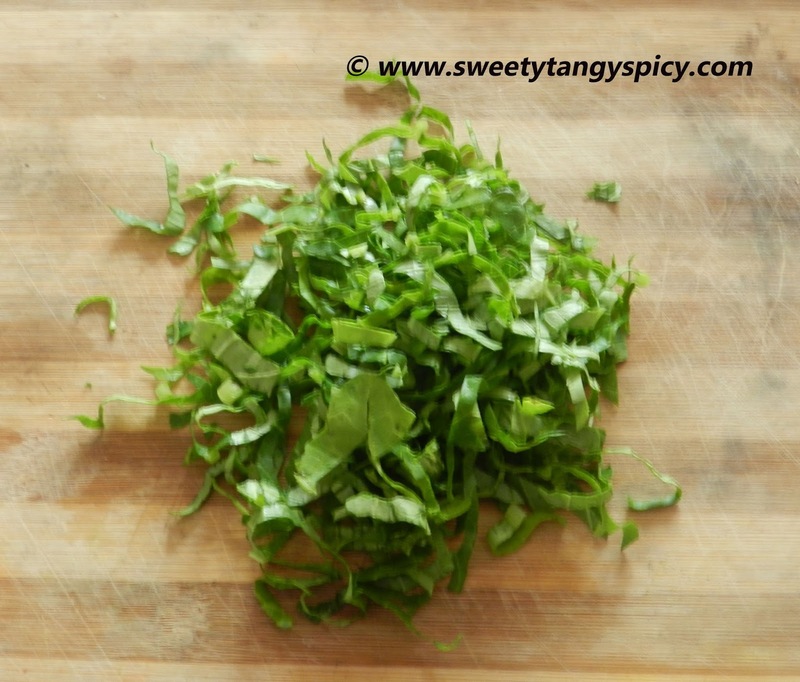 Then chop finely with a knife, never make big pieces. After the resting time, squeeze the juice by pressing tightly between your hands. 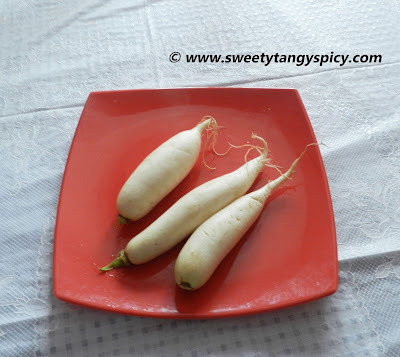 Reserve the water and transfer the radish into a small bowl. Do not discard the radish juice. This will be used while making the dough. Add wheat flour and salt if needed as we have already added salt while taking the juice. Mix well and make a soft dough just like chapathi dough. Add water or flour if needed. 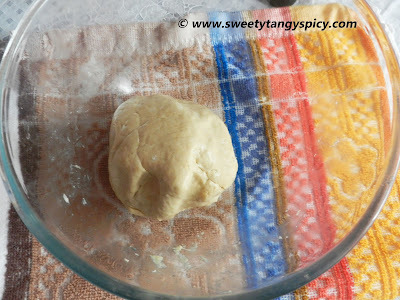 The dough should not be too soft and too hard. 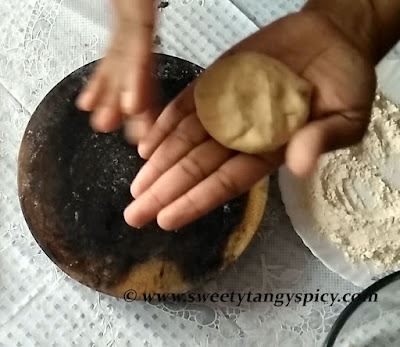 Apply some oil and keep this rest for 15 to 20 minutes. After 15 minutes, knead it well and make lemon sized balls. Now, we will prepare the stuffing. 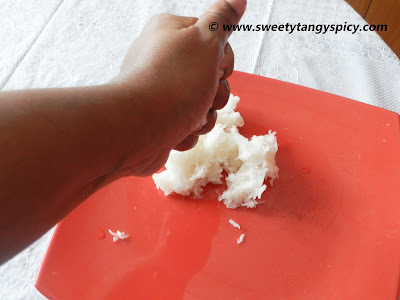 Squeeze the radish once again and remove juice if any. To this add spices like red chili powder, coriander powder and garam masala. 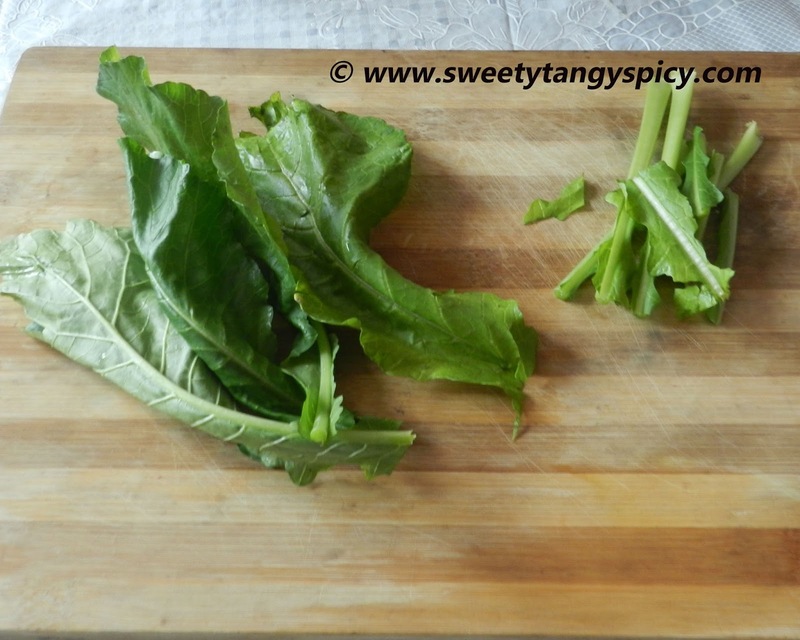 Add chopped radish leaves also. Note: You can use green chilies instead of chili powder, if so, chop it as finely as you can. 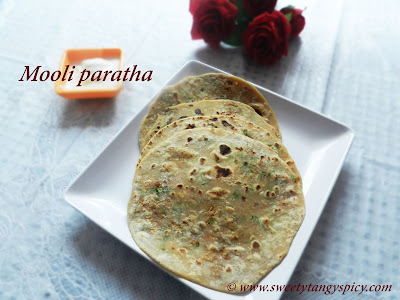 Mix well and immediately after the preparation of the stuffing, start making parathas, otherwise it will again watery and your parathas will break. 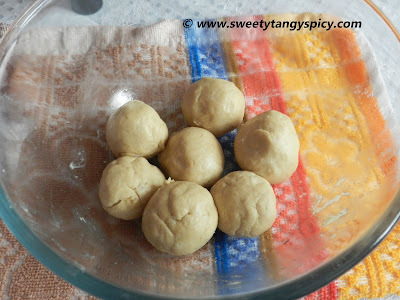 Take the one small dough ball, dust enough flour, and roll into small disc by pressing the sides with your hands, Always try to make thin edges, but thick center. Because if you make roties with same the thickness, it will be difficult to role. Put 1 or 1 ½ tablespoon stuffing, depending on the size of dough ball you made. Cover this by making fleets as in the picture. Then join them together and seal it. Press the parathas and flatten it. Dip in flour and place it on the board. The folded portion should come up. 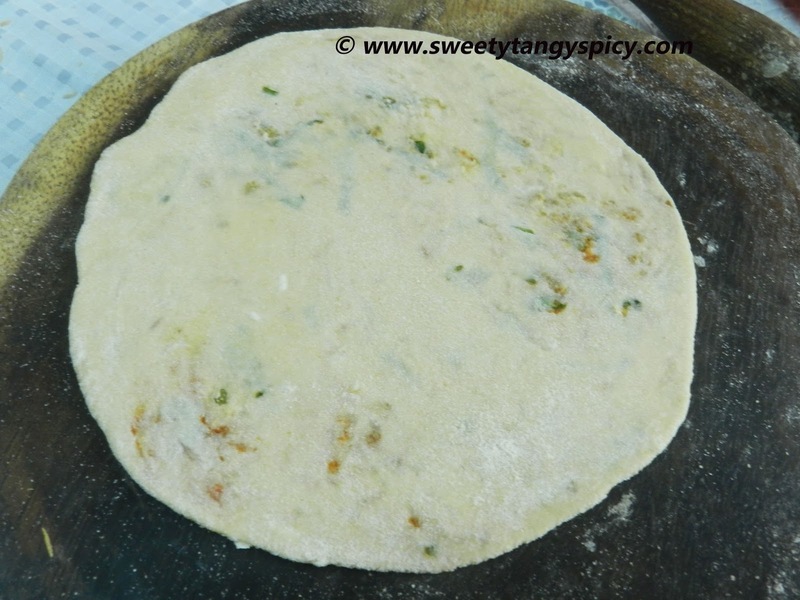 Roll into thin parathas with gentle pressure. 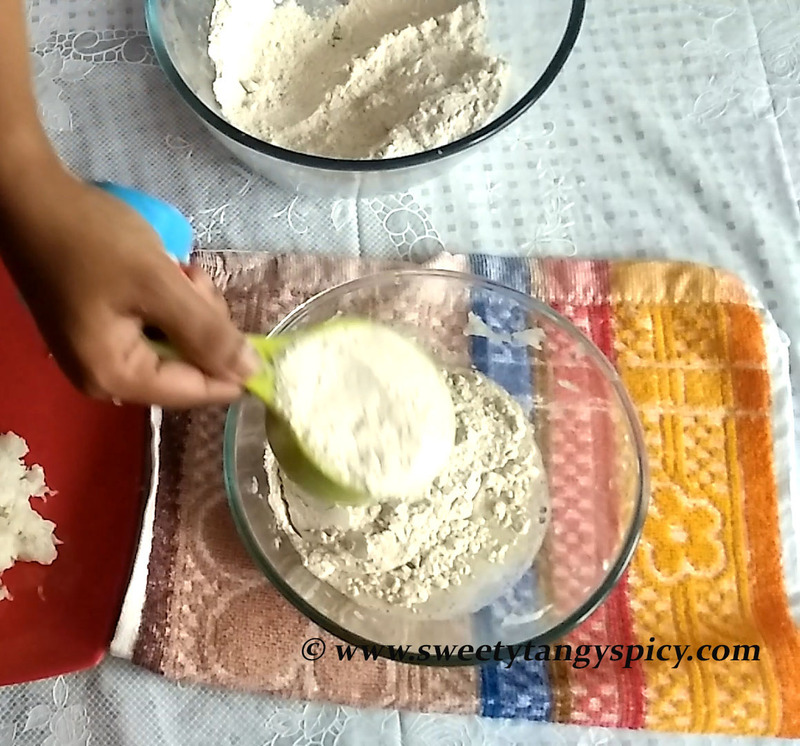 Do not give too much pressure and also use enough flour to dust. Heat a pan or tawa on medium flame. 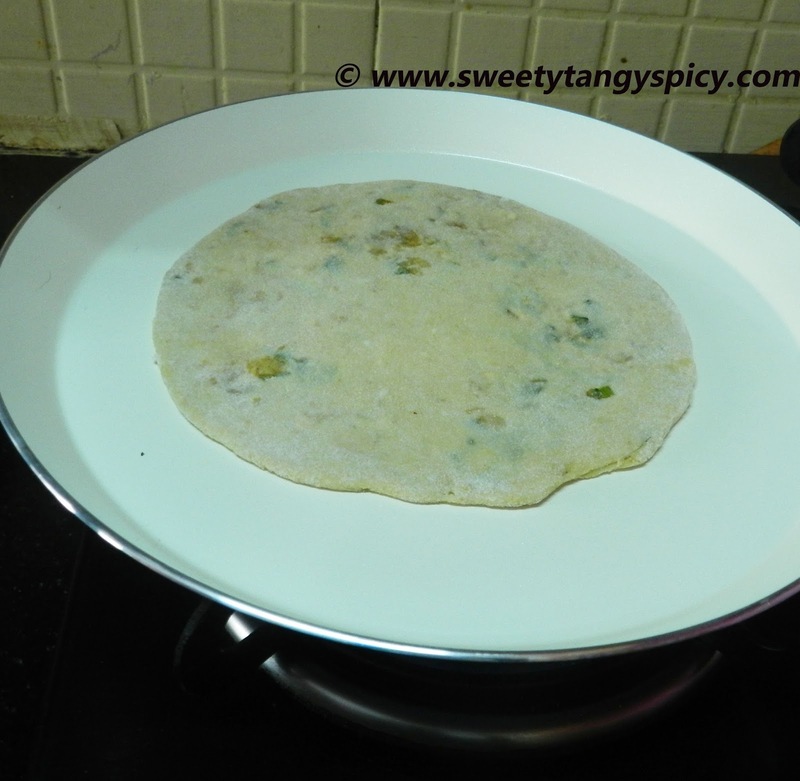 When hot, place parathas on it. When tiny bubbles appear on top, flip it. 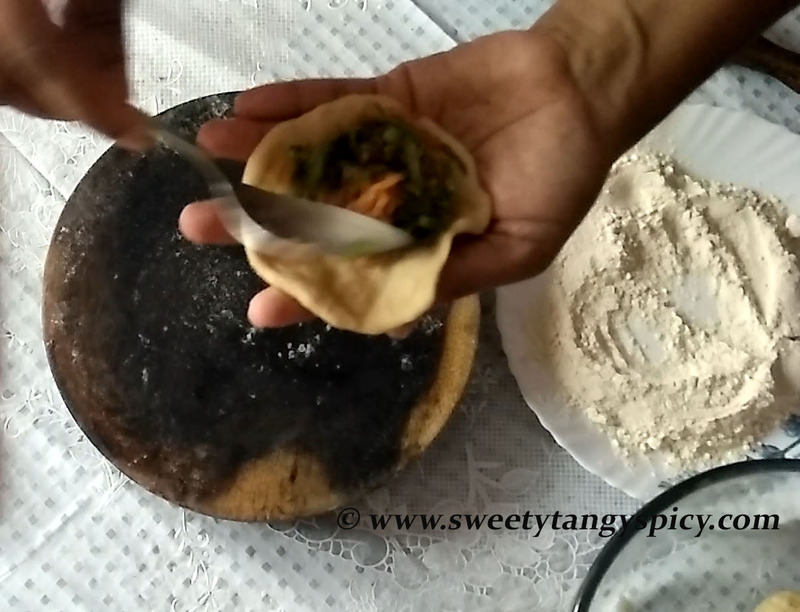 And apply oil or ghee. 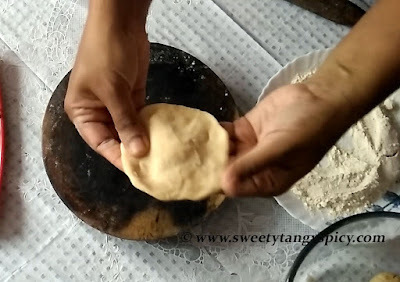 After one to two minutes, when the chapatti is cooked, flip and apply oil or ghee on top, flip again, apply the oil and cook for one or two seconds. 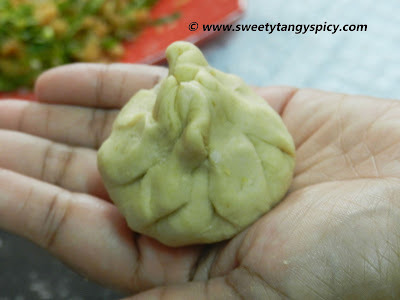 Remove from heat and serve with curd or pickles. 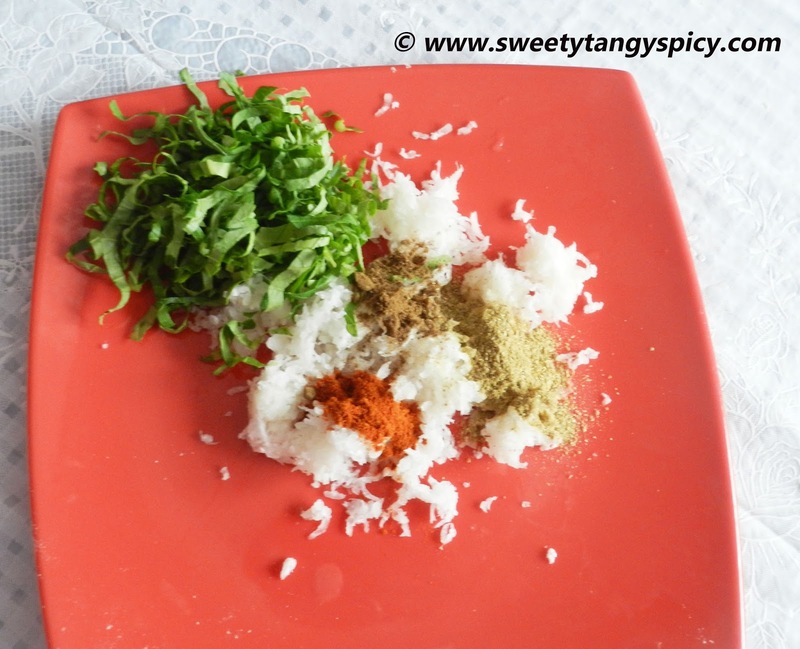 Always squeeze and remove the juice completely before adding spices. 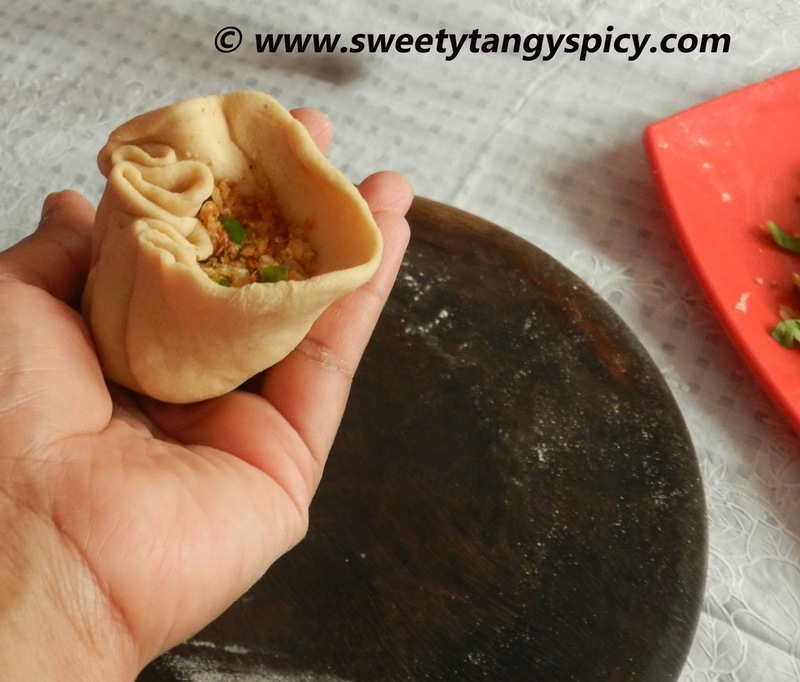 Always add the spices only when you start preparing the chapathis, and remember to squeeze the radish again before you add the spices. Do not keep the filling for a long time as the radish has a tendency to release more water with time. 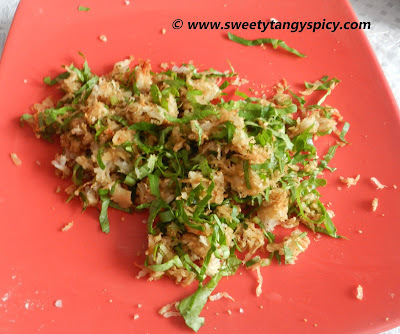 You can use finely chopped green chilies instead of red chili powder.